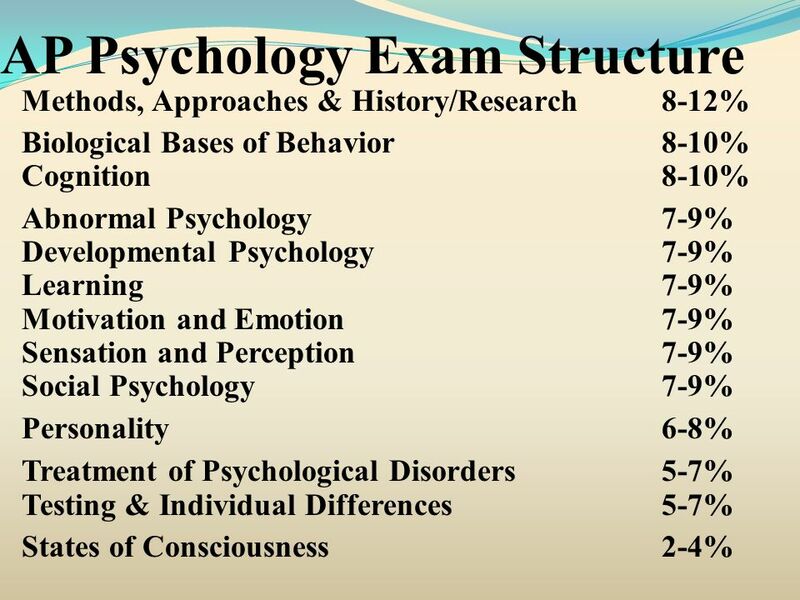 Knowledge Need to know the material of a typical Introduction to Psychology course at the college level. 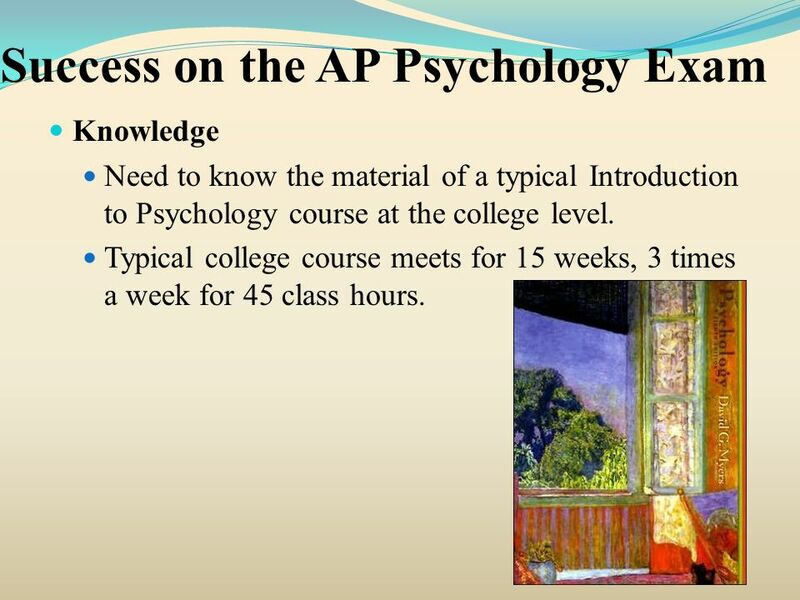 Typical college course meets for 15 weeks, 3 times a week for 45 class hours. 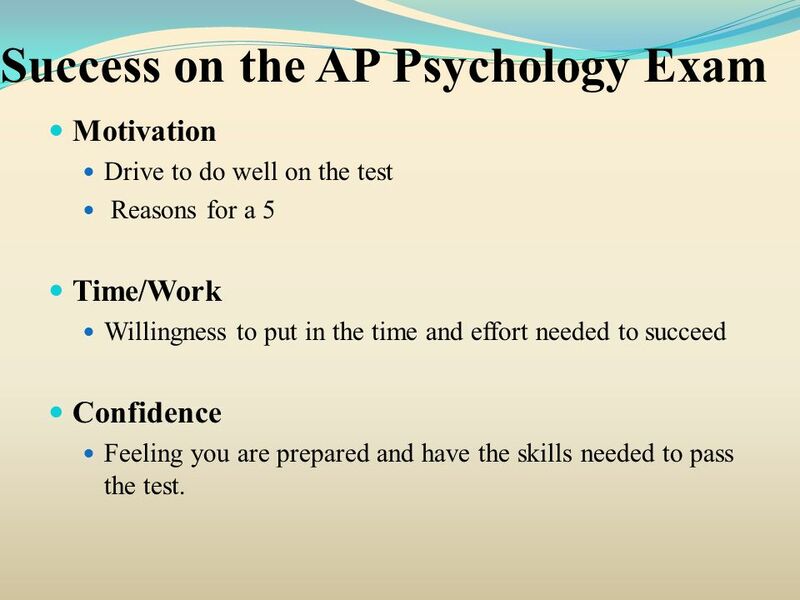 Motivation Drive to do well on the test Reasons for a 5 Time/Work Willingness to put in the time and effort needed to succeed Confidence Feeling you are prepared and have the skills needed to pass the test. 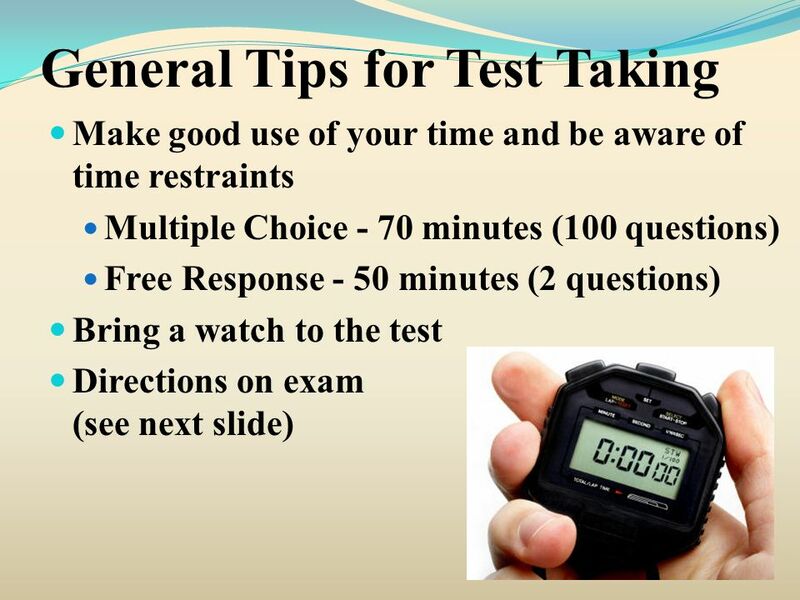 Make good use of your time and know your time restraints Use your time effectively, working as quickly as you can without losing accuracy. 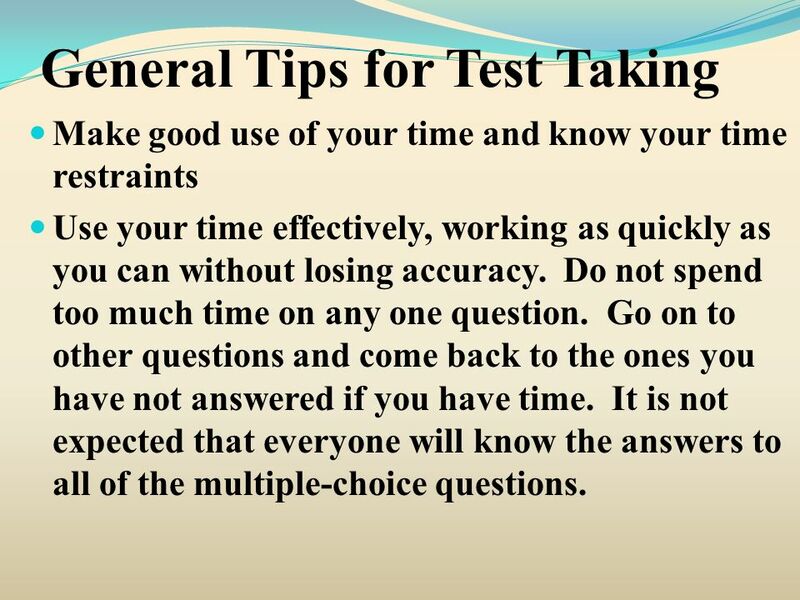 Do not spend too much time on any one question. 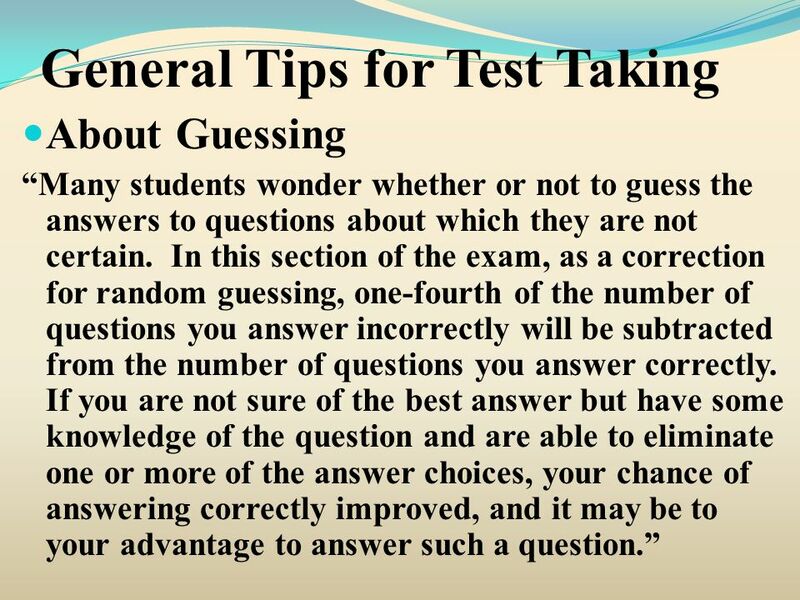 Go on to other questions and come back to the ones you have not answered if you have time. 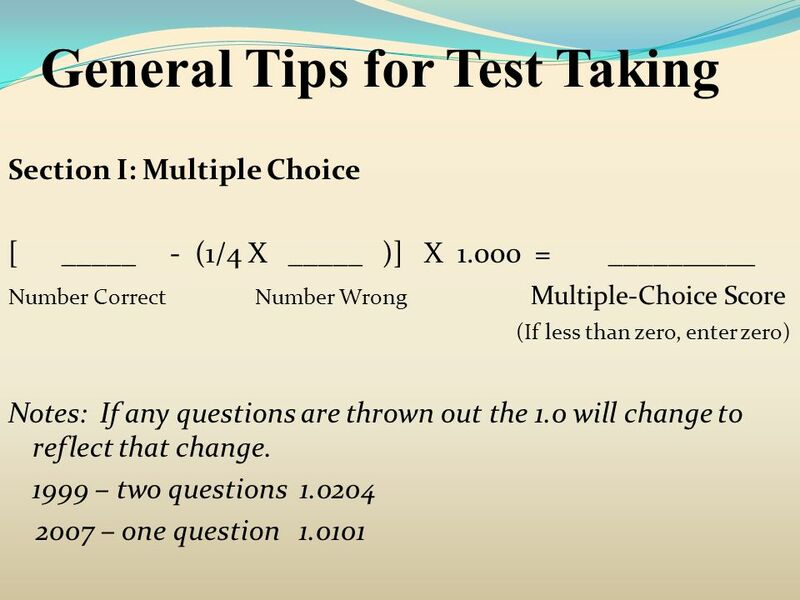 It is not expected that everyone will know the answers to all of the multiple-choice questions. 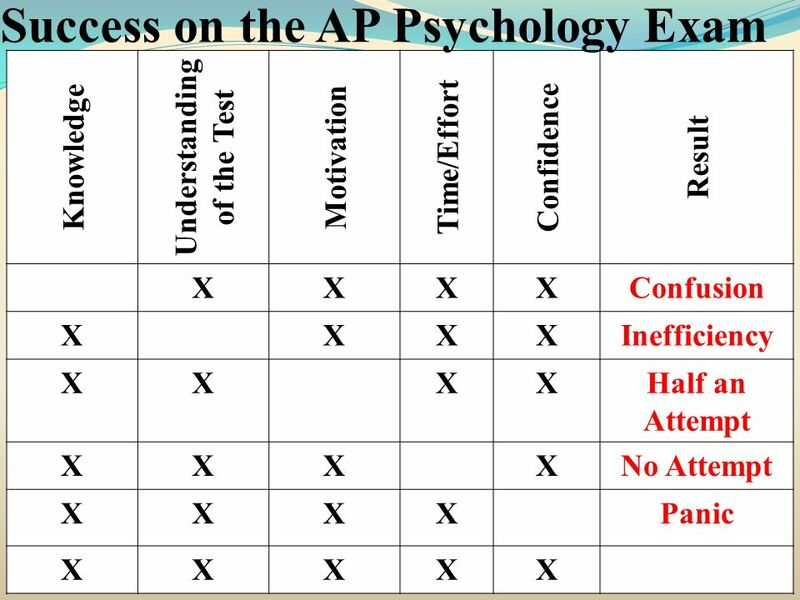 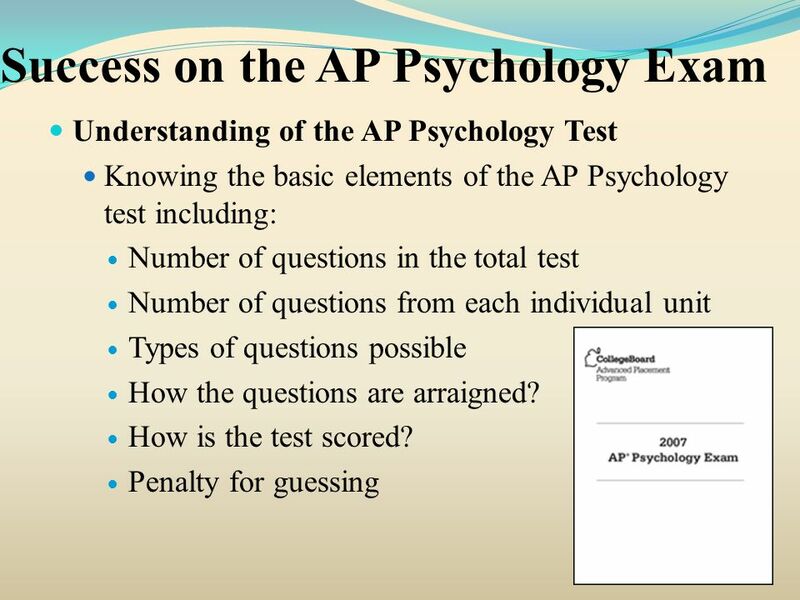 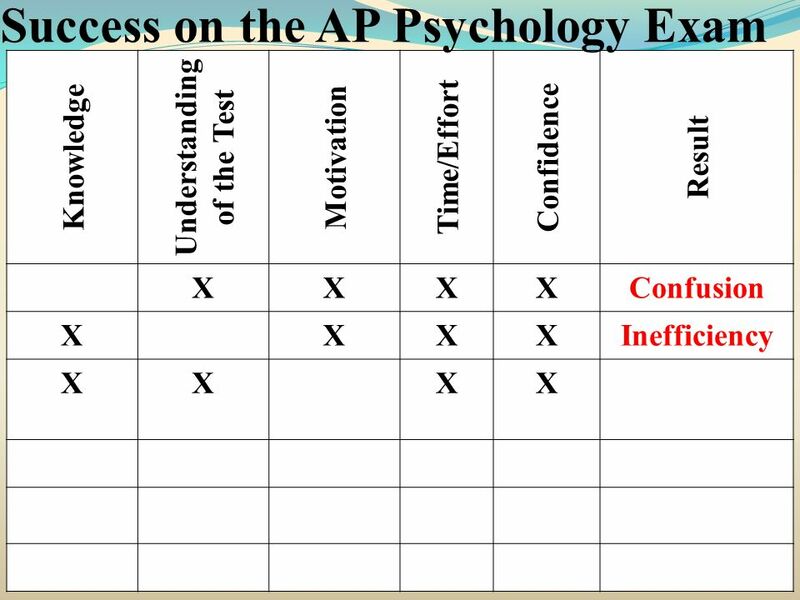 Why you should guess on the AP Psychology Exam Jim answers 70 questions and is unsure about the other 30. If he leaves the 30 questions blank, he gets 70 points. 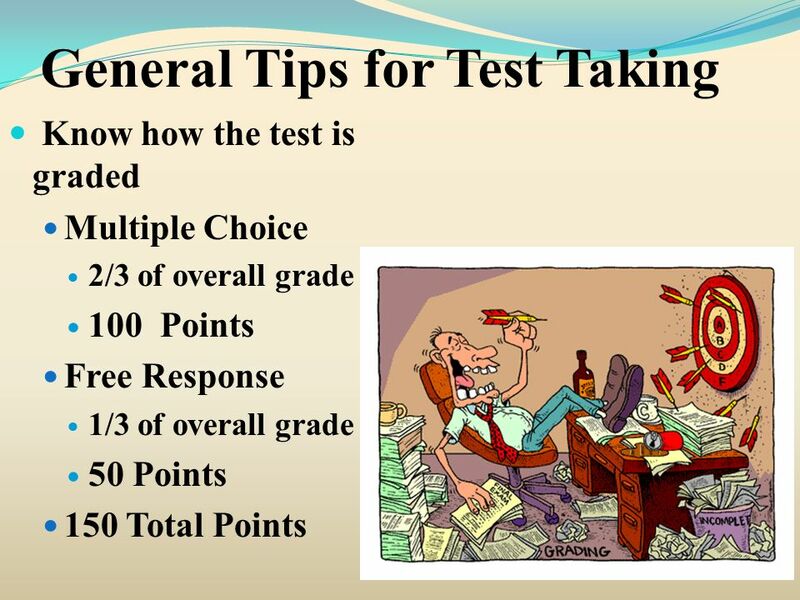 70 – (0)( ¼) = 70 If he guesses at the 30 questions, he is likely to get 1 in 5, or 6, correct and 24 incorrect. 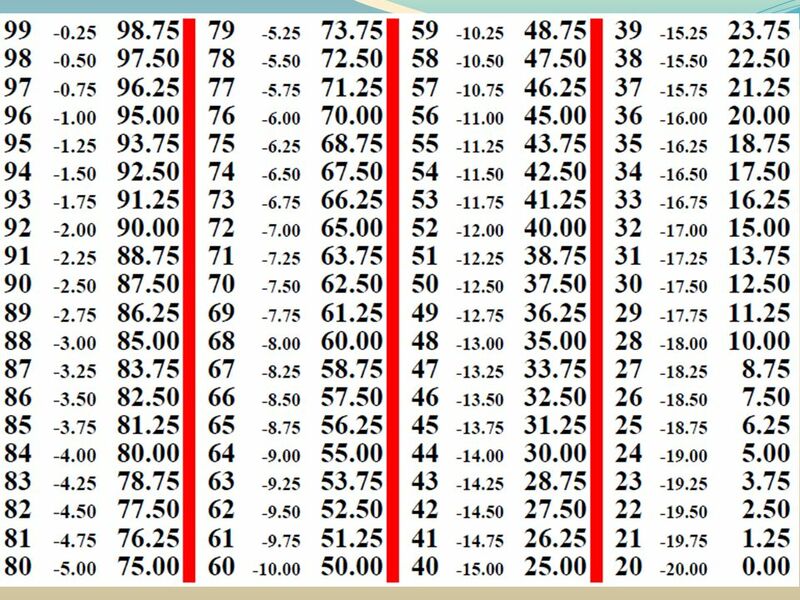 76 – (24)( ¼) = 70 No difference. 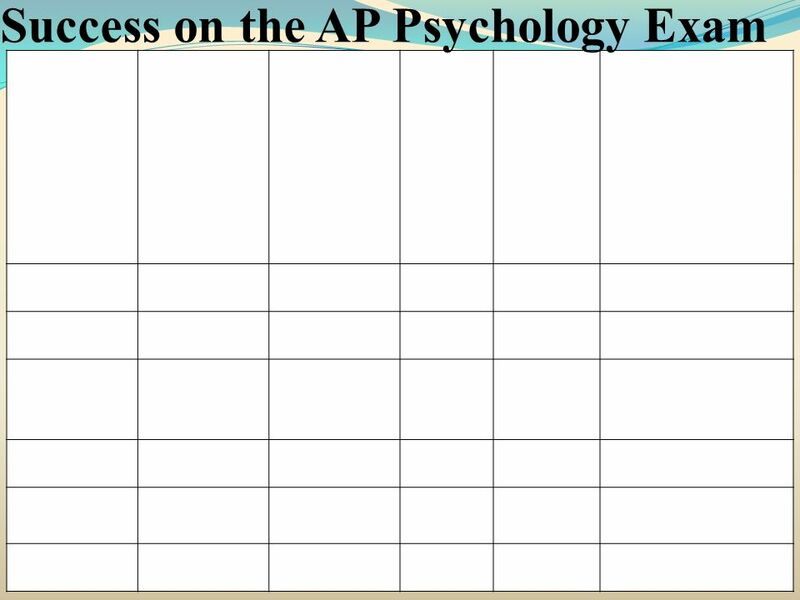 He breaks even. 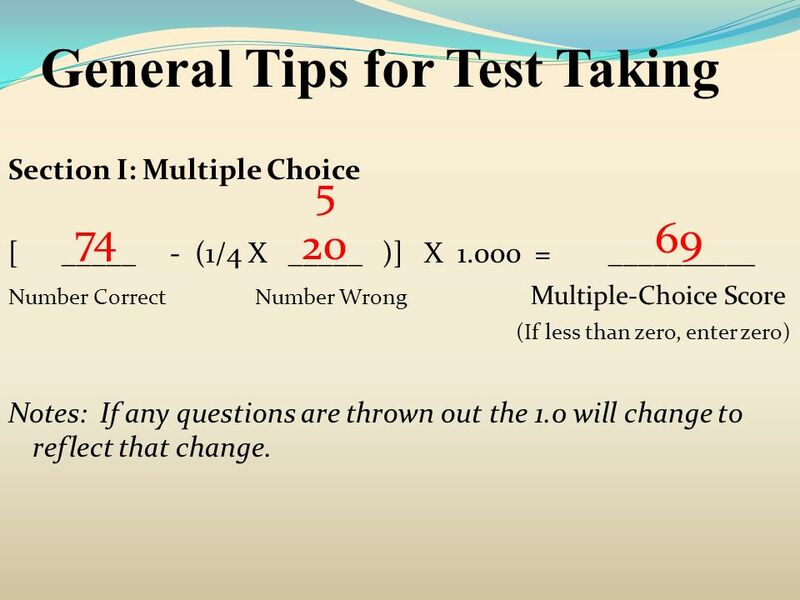 If he can eliminate one incorrect choice and guess at the 30 questions, he is likely to get 1 in 4, or 7.5, correct. 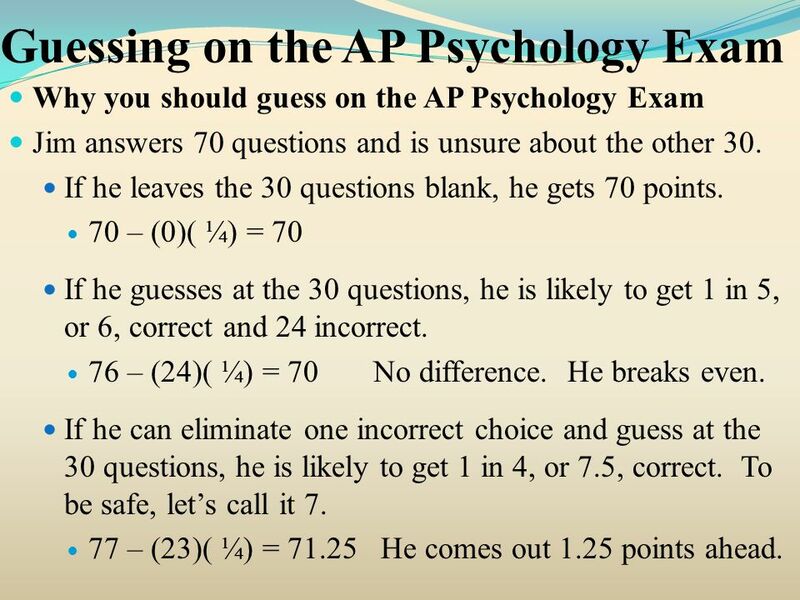 To be safe, let’s call it 7. 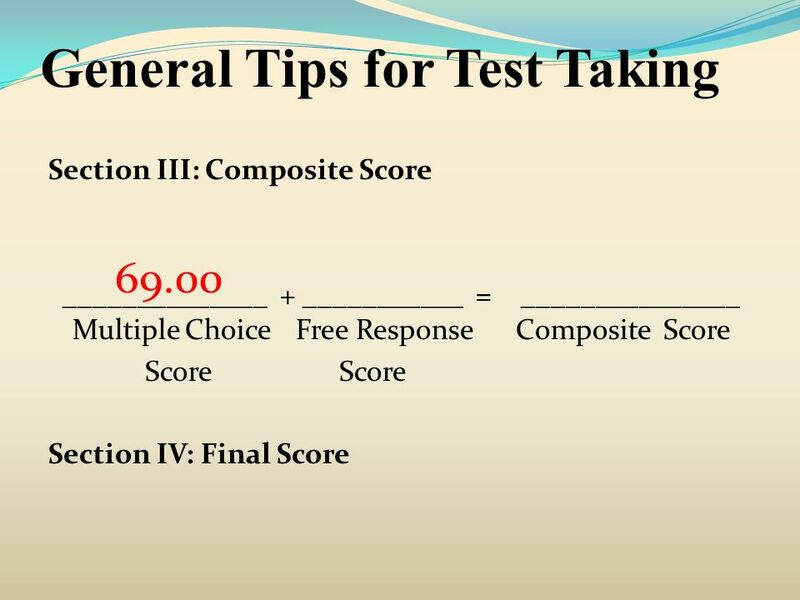 77 – (23)( ¼) = He comes out 1.25 points ahead. 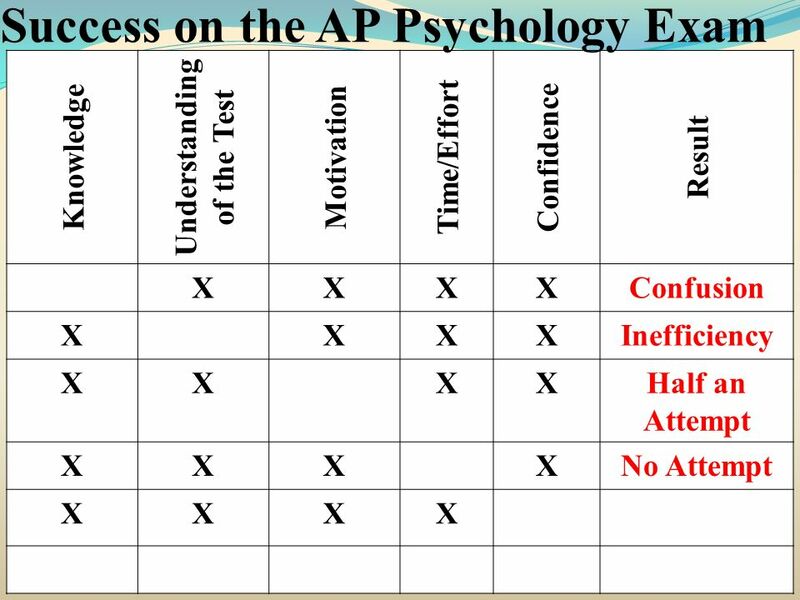 Why you should guess on the AP Psychology Exam If he can eliminate two incorrect choices and guess at the 30 questions, he is likely to get 1 in 3, or 10, correct. 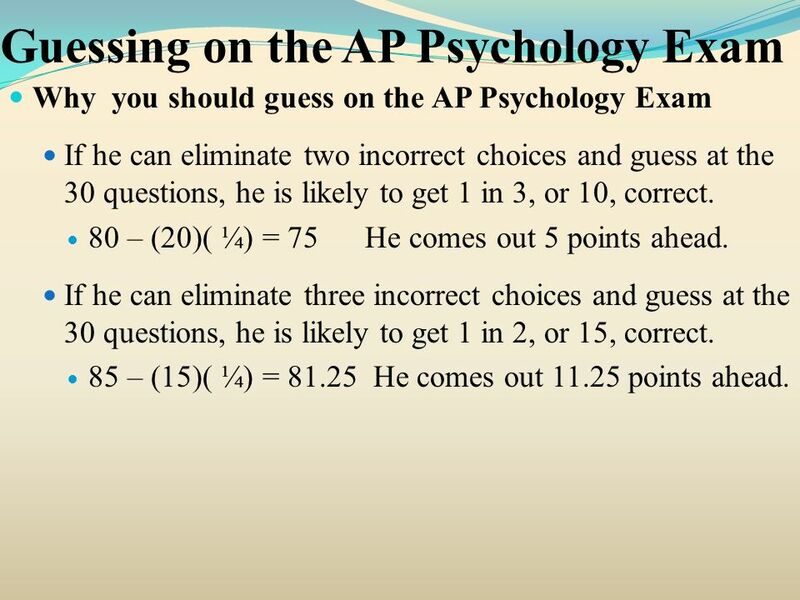 80 – (20)( ¼) = 75 He comes out 5 points ahead. 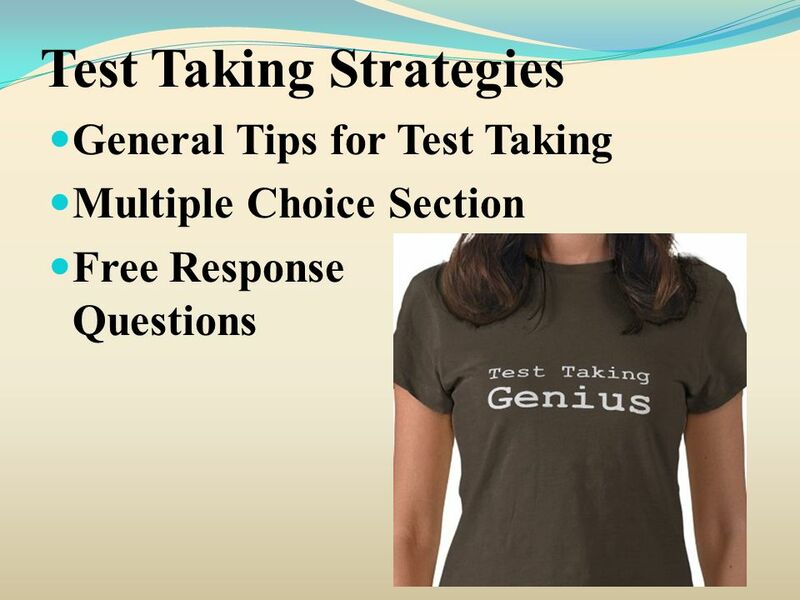 If he can eliminate three incorrect choices and guess at the 30 questions, he is likely to get 1 in 2, or 15, correct. 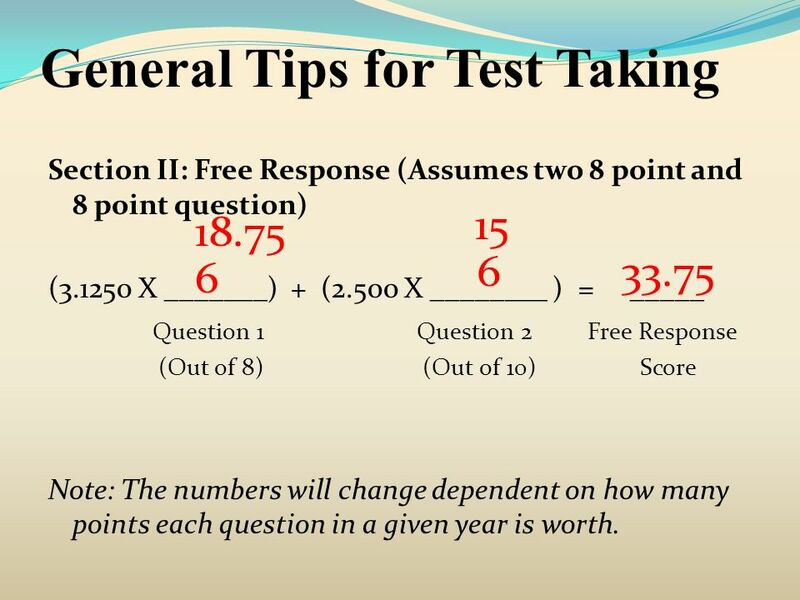 85 – (15)( ¼) = 81.25 He comes out points ahead. 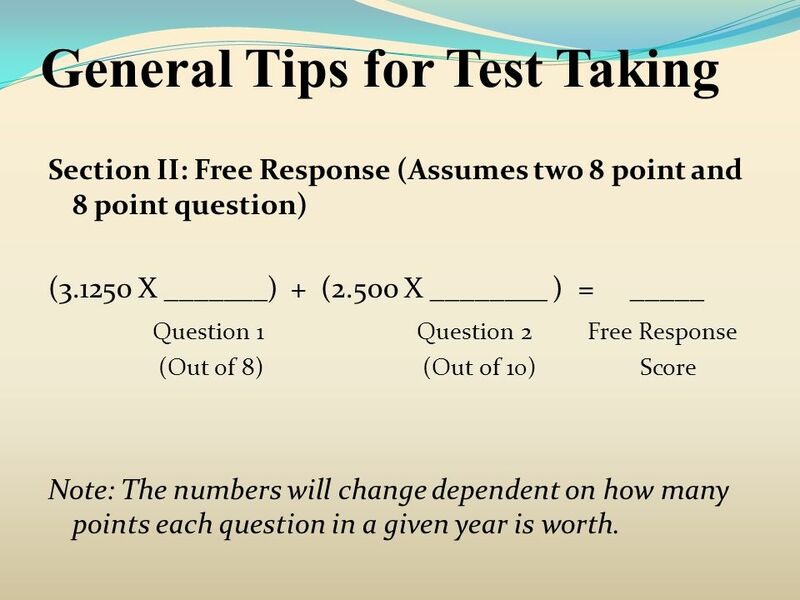 Section II: Free Response (Assumes two 8 point and 8 point question) ( X _______) + (2.500 X ________ ) = _____ Question Question Free Response (Out of 8) (Out of 10) Score Note: The numbers will change dependent on how many points each question in a given year is worth. 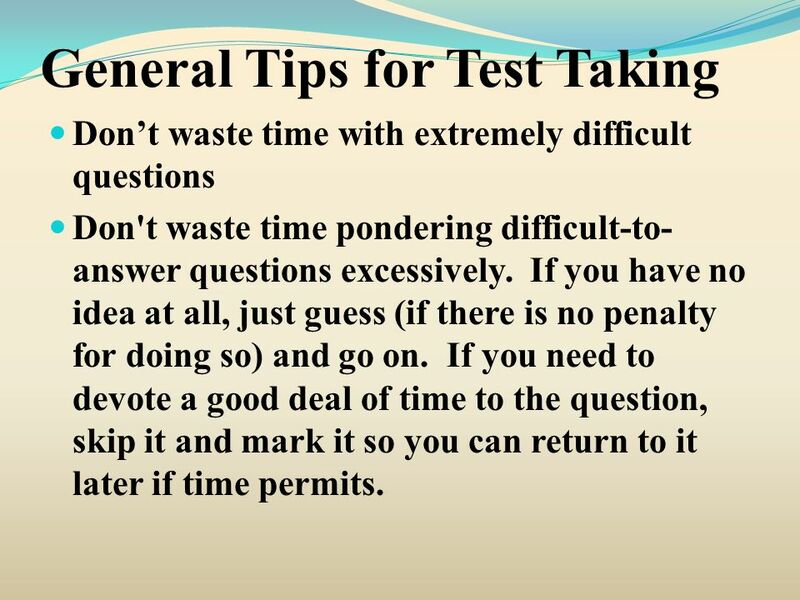 Don’t waste time with extremely difficult questions Don't waste time pondering difficult-to-answer questions excessively. 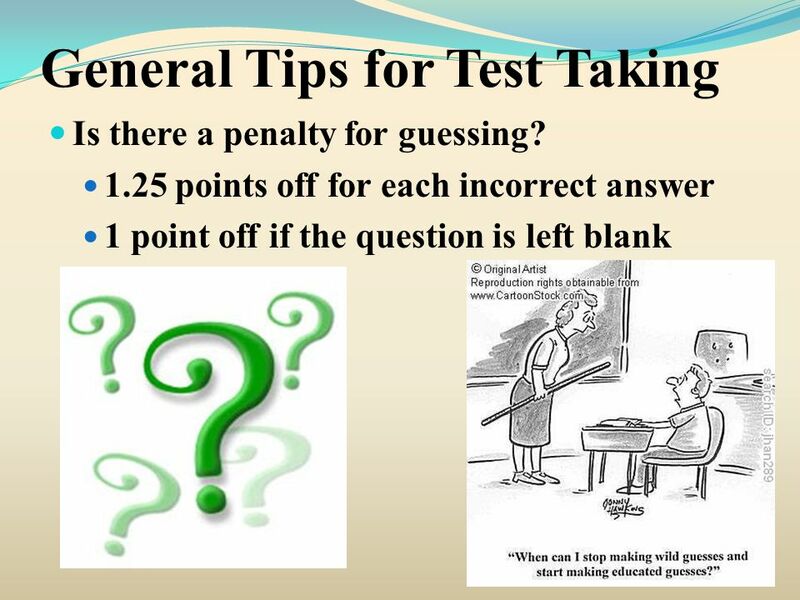 If you have no idea at all, just guess (if there is no penalty for doing so) and go on. 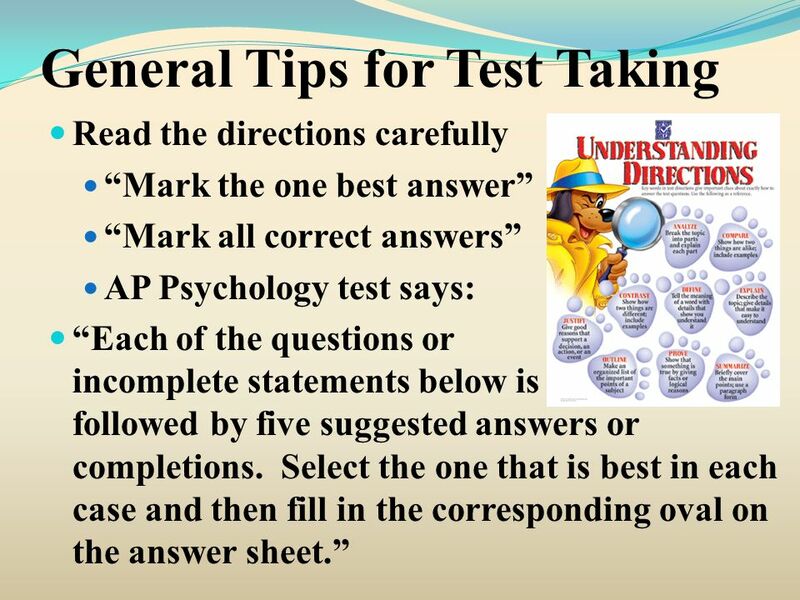 If you need to devote a good deal of time to the question, skip it and mark it so you can return to it later if time permits. 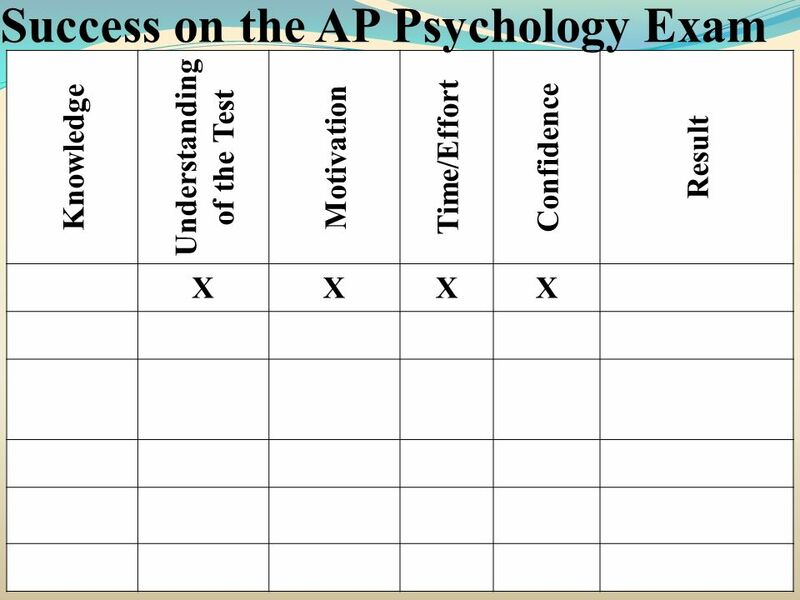 Are charts, graphs, drawings, etc on the test? 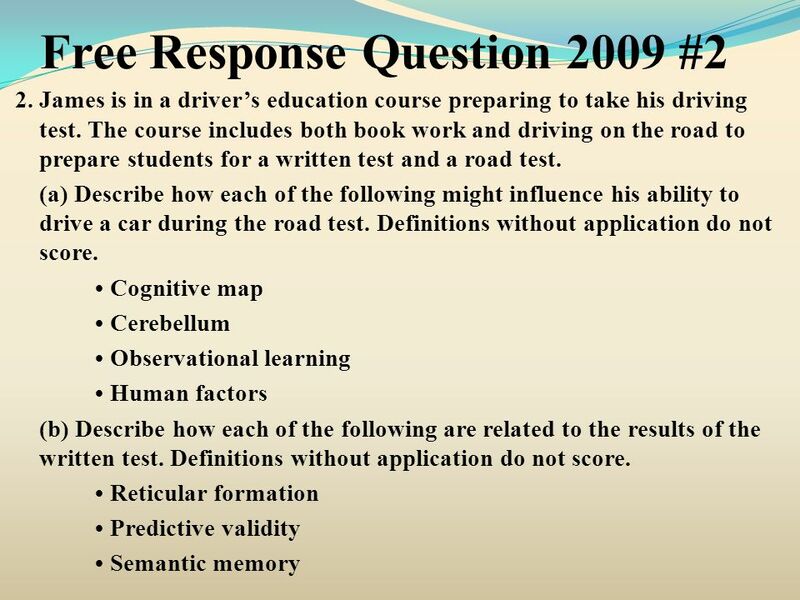 Are there names on the test? 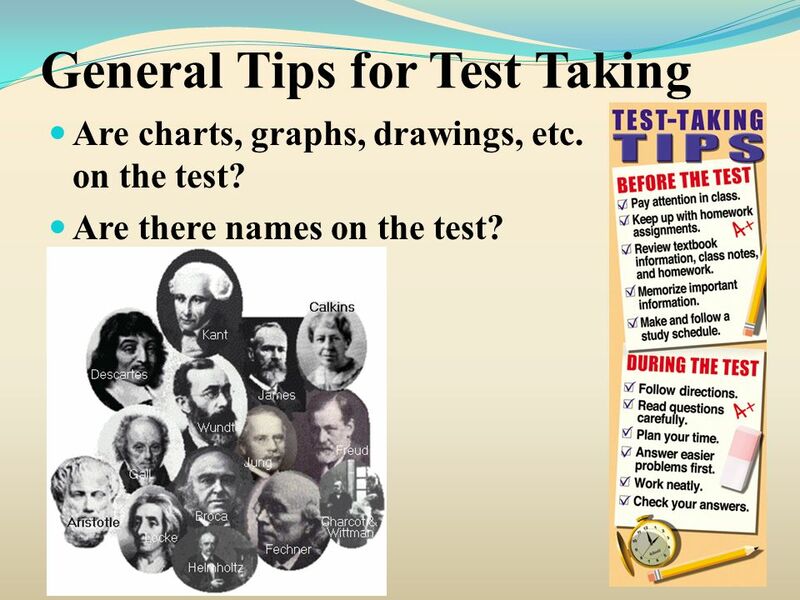 Keep to the level of the test Adopt the appropriate level of sophistication for the test. 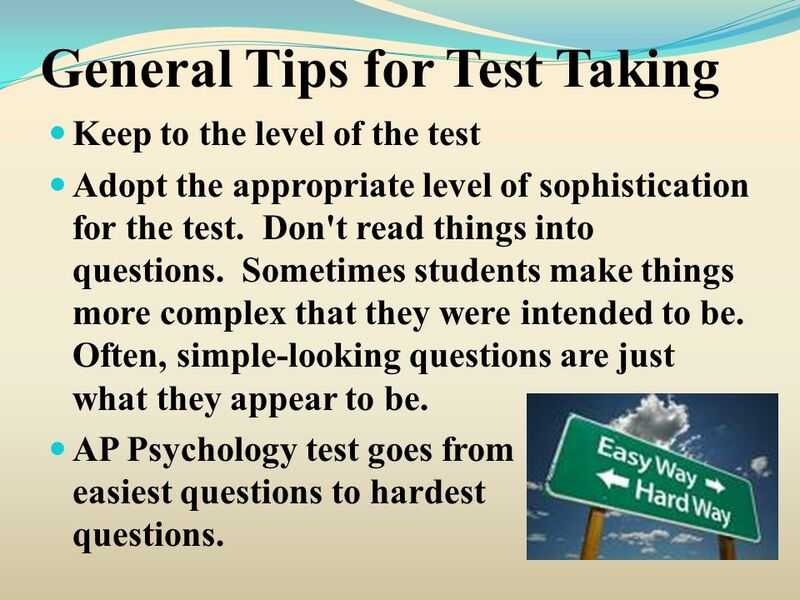 Don't read things into questions. 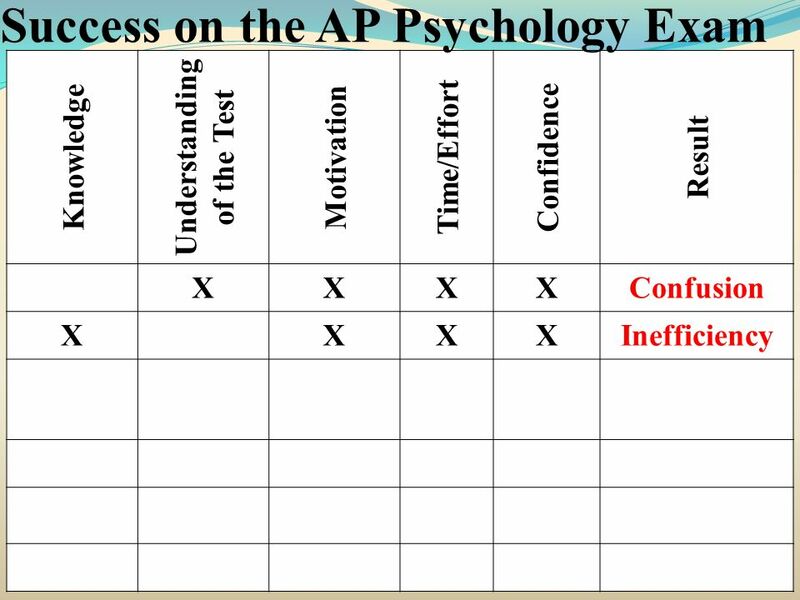 Sometimes students make things more complex that they were intended to be. 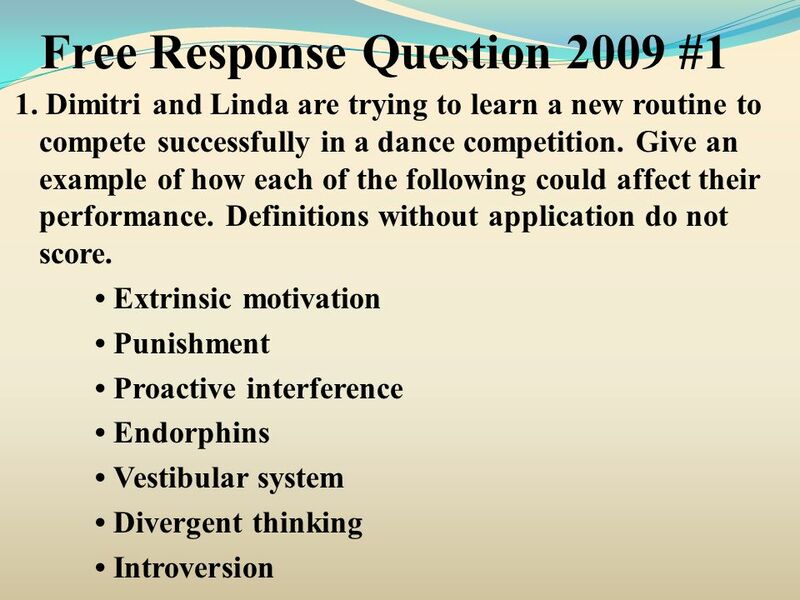 Often, simple-looking questions are just what they appear to be. AP Psychology test goes from easiest questions to hardest questions. 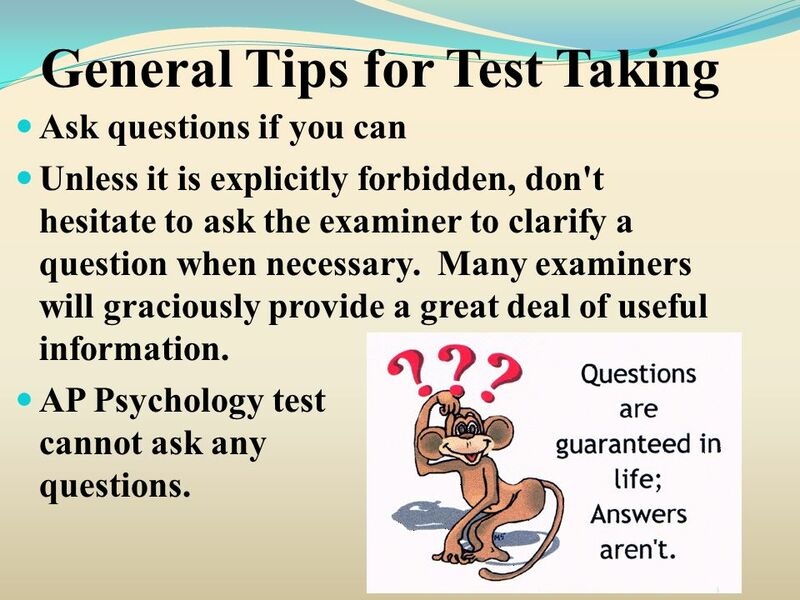 Ask questions if you can Unless it is explicitly forbidden, don't hesitate to ask the examiner to clarify a question when necessary. 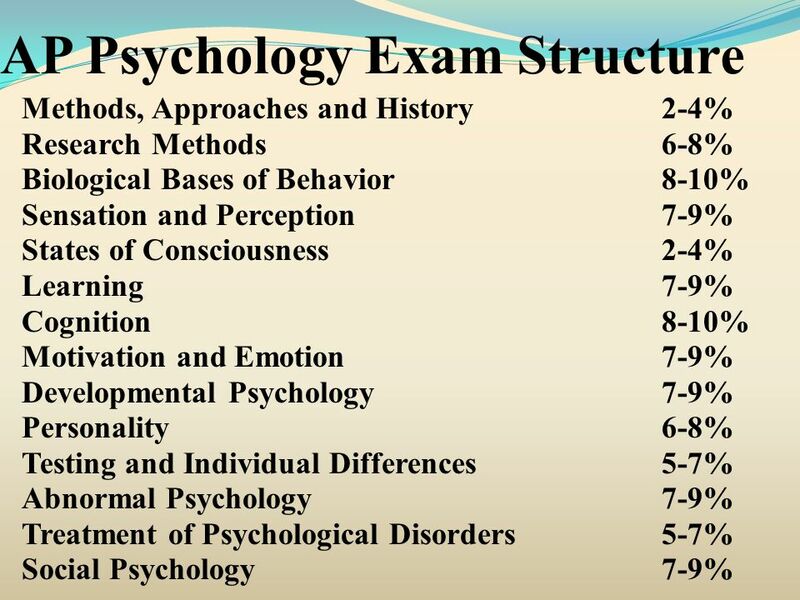 Many examiners will graciously provide a great deal of useful information. AP Psychology test cannot ask any questions. 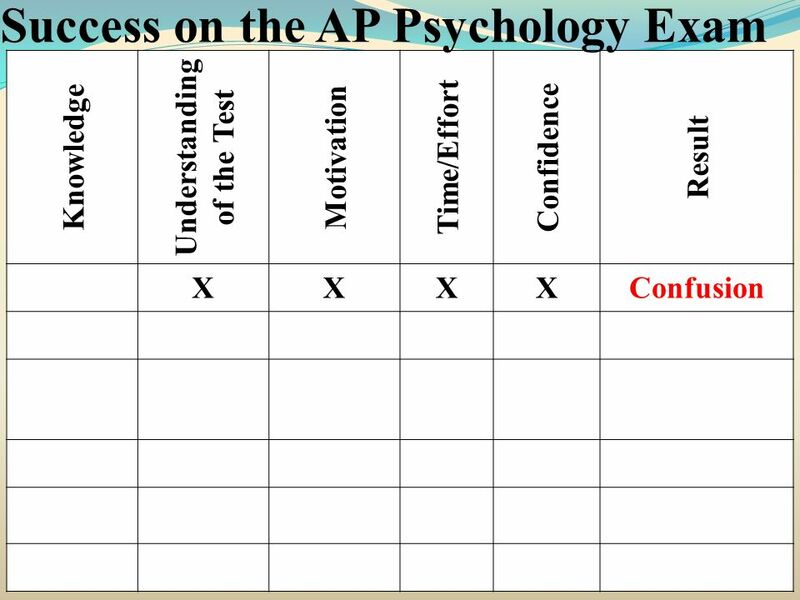 If possible, review your answers If you complete all of the questions and still have some time remaining, review the test. 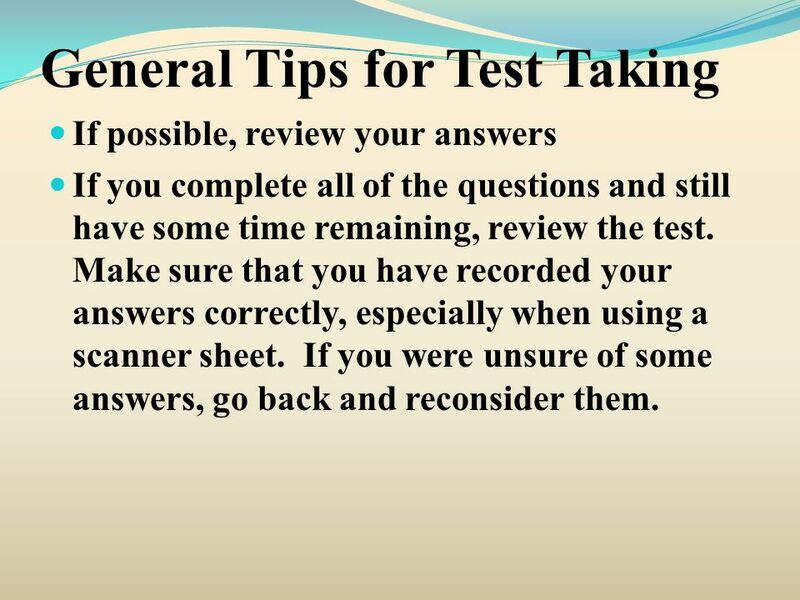 Make sure that you have recorded your answers correctly, especially when using a scanner sheet. 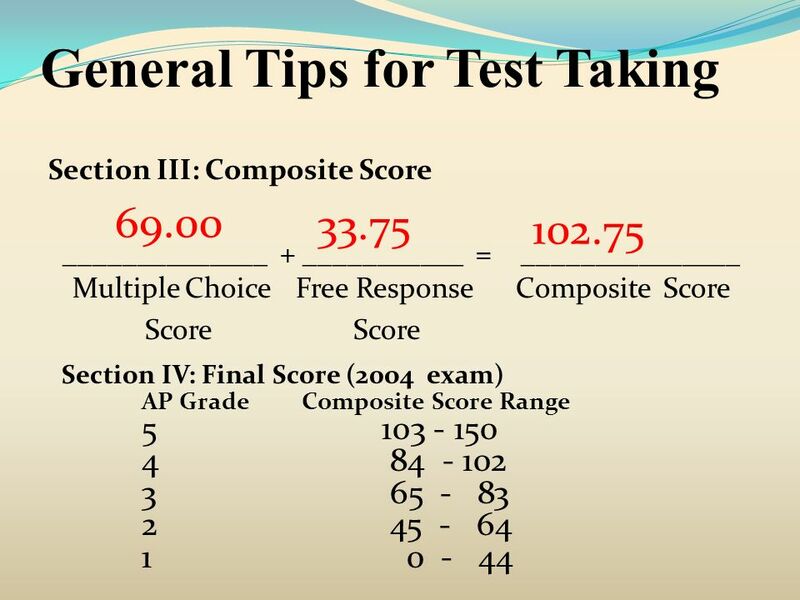 If you were unsure of some answers, go back and reconsider them. 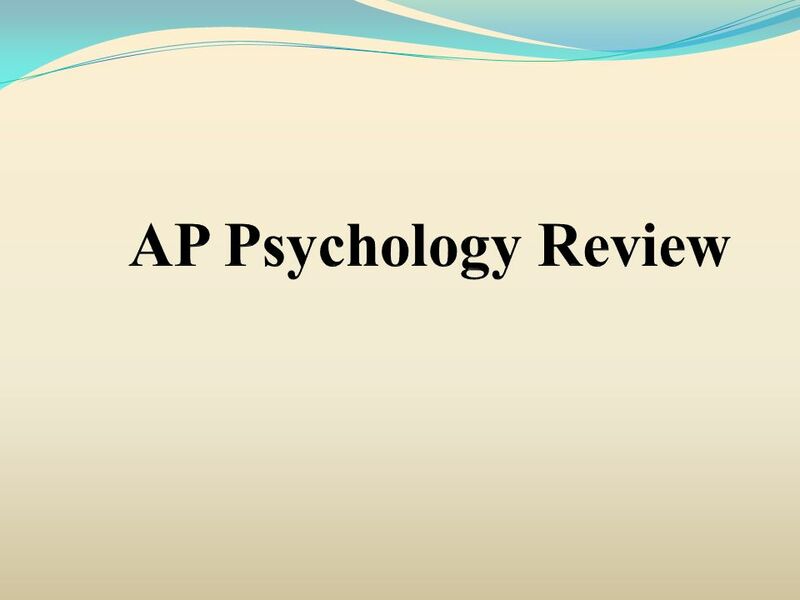 Download ppt "AP Psychology Review." 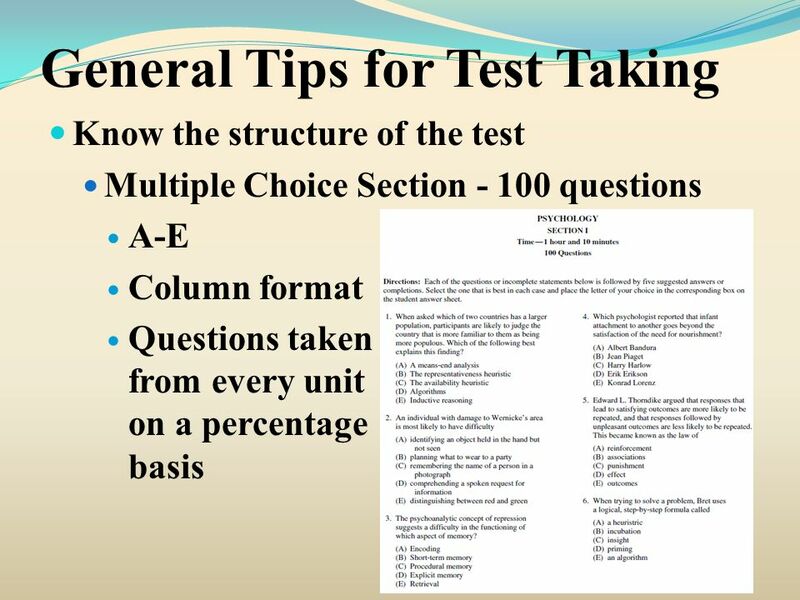 Last Minute Overview Last Minute Overview Monday May 7, Noon Make sure you get something to eat If you have C or D lunch, you will eat A or B lunch. 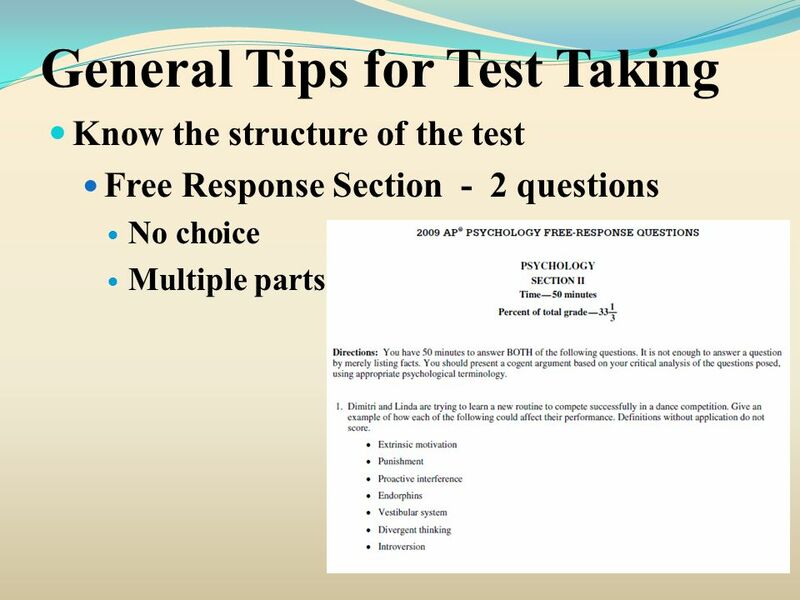 What you need to know about the AP Biology Exam. Reasons for taking the AP Bio Exam For personal satisfaction To compare yourself with other students. AP Psychology Review. 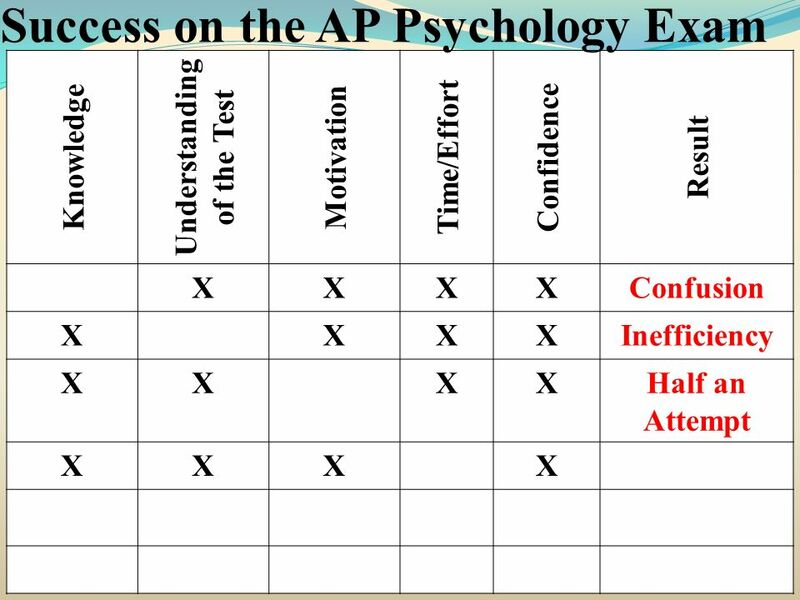 Success on the AP Psychology Exam Understanding of the AP Psychology Test Understanding of the AP Psychology Test Types of questions. 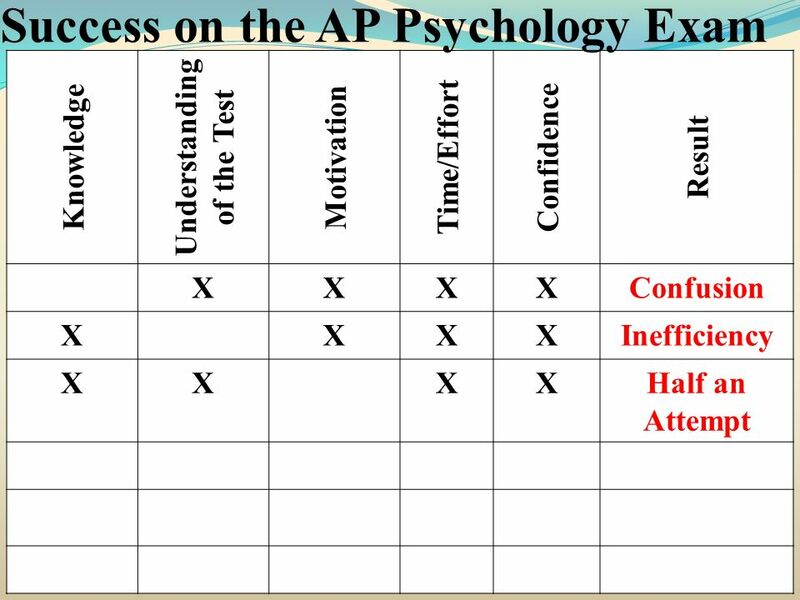 HISTORY AND APPROACHES CYPA AP Psychology Review Session 1.